when we can’t locate the 1 tsp measure. The teachable moment is ever-present and just waiting to be exploited. While recipes often recommend lighter flours, I actually used stone-ground whole wheat with just a bit of white flour and the results were not heavy at all. While I call these blueberry, I did make a few without the fruit (I just made a batch without and then added the blueberries to the batter) and both were excellent. This recipe gives the right amount for the whole batch. “These taste like heaven, Mom,” was the verdict. And I’ve got six leftover pancakes frozen in wax paper and a plastic tub to crisp up in the toaster oven one of these cold, but not leisurely mornings soon! Read on for recipe! Frozen blueberries work fine in this recipe! In a separate bowl, stir all wet ingredients (except blueberries) together. Add wet ingredients to dry and mix thoroughly into a batter. Add blueberries and stir to distribute evenly. Heat a skillet until sizzling. Lower heat a bit, and add oil or butter. Do not let butter burn (sometimes adding a drop of oil to your butter keeps it from burning). Drop large tablespoons of batter onto the griddle leaving space between. Smaller pancakes are easier to flip so don’t make them big!). Cook at medium high (or lower if things seem to be progressing too quickly), flipping the pancakes with a spatula when you start to see bubbles on the surface…about 2-3 minutes. Cook another 3 minutes on the other side and then start piling on plates and make another batch! 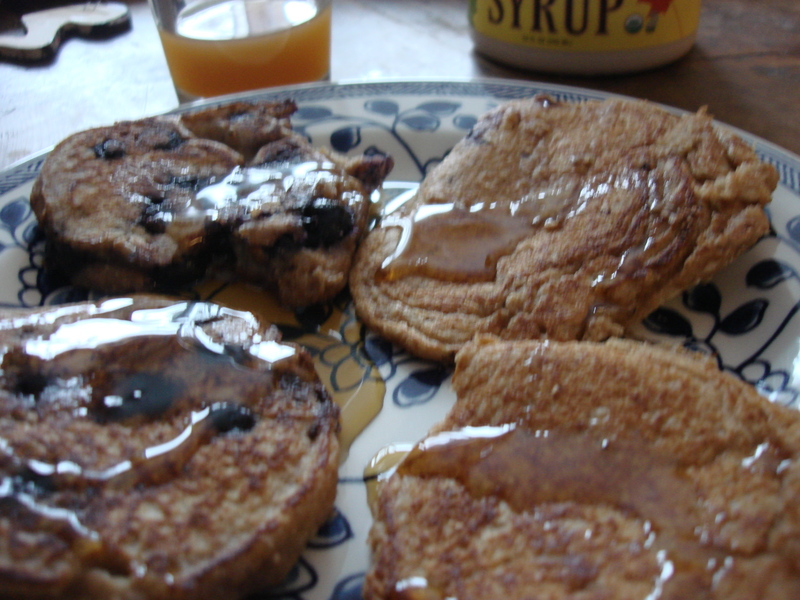 Serve with apple sauce, maple syrup, or whatever you like on your pancakes. They were great frozen too! 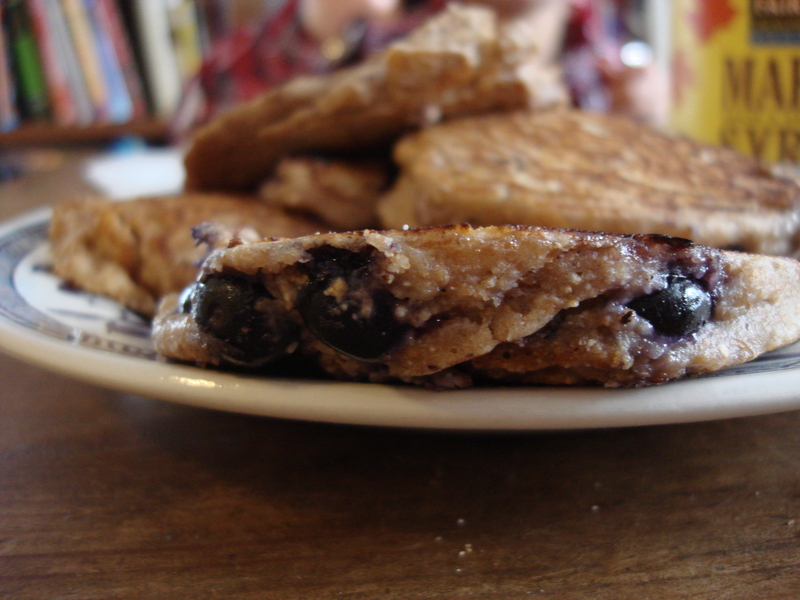 These blueberry pancakes look amazing and delicious! They came in handy just this morning!!!! Funnily enough, the little man prefers the plain ones to the blueberry…They toasted up very well…took under 10 minutes from frozen.